Kaye Ballard is without a doubt one of the great ladies of show business. From burlesque to vaudeville, from big bands to nightclubs, from movies and television to Broadway, Kaye Ballard has seen it all and done it all. Now she tells all in a gossipy, upbeat memoir filled with great anecdotes that reveal the highs and lows of her legendary 60-year career. Here's her childhood in Cleveland; discovery by band leader Spike Jone in the 1940's; Broadway stardom in the The Golden Apple in 1954; time at the Actor's Studio with Marlon Brando, Marilyn Monroe and others; appearance on the cover of Life magazine; role in Cinderella with Julie Andrews on live TV; backstage antics with Lenny Bruce at the Hungry i; co-starring role in the hit sitcoms The Mothers-in-Law and The Doris Day Show; return to Broadway in the The Pirates of Penzance in the 1980's; appearance in the fabled 1998 Paper Mill Playhouse production of Follies; and more. Here, too, are revealing anecdotes about virtually every superstar Ballard ever worked with, including Lucille Ball, Carol Burnett, Bette Davis, Barbra Streisand, Doris Day, Judy Garland, Cary Grant, Ethel Merman, Ray Bolger, Bert Lahr, Phil Silvers, Bob Hope, and Johnny Carson. 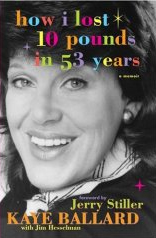 Affectionate, laugh-out-loud funny, and impossible to put down, How I Lost 10 Pounds in 53 Years is an unforgettable memoir from a legendary trouper. Kaye Ballard has appeared on Broadway and television, in nightclubs, cabaret, and film throughout a career that spans more than 60 years. Today, she continues to perform on stage, screen, television and in concert. She lives in Palm Springs, California. Visit the author's website at www.kayeballard.com.